Requirements were REVISED effective January 1, 2003. To see the changes which were made, Click here. For the previous requirements, Click here. Discuss safety on the golf course. Show that you know first aid for injuries or illnesses that could occur while golfing, including lightning, heat reactions, dehydration, blisters, sprains, and strains. Study the USGA Rules of Golf now in use. Tell about the three categories of golf etiquette. Show that you know about the definitions of golf terms. Show that you understand the "Rules of Amateur Status." Tell about your understanding of the USGA system of handicapping. Tell about the early history of golf. Describe its early years in the United States. Tell about the accomplishments of a top golfer of your choice. 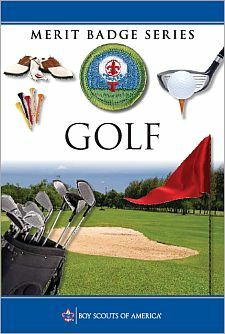 Discuss with your counselor vocational opportunities related to golf. Tell how golf can contribute to a healthy lifestyle, mentally and physically. Tell how a golf exercise plan can help you play better. Show two exercises that would improve your game. The proper grip, stance, posture, and key fundamentals of a good swing. Driver played from a tee. The approach, chip-and-run, and pitch shots. The sand iron shot, bunker, or heavy rough recovery shots. Follow the "Rules of Golf". Show respect to fellow golfers, committee, sponsor, and gallery. Blanks in this worksheets table appear when we do not have a worksheet for the badge that includes these requirements.